A £30,000 grant to a Yorkshire rescue team has enabled the completion of a major redevelopment at its base. The Cave Rescue Organisation is celebrating the 75th anniversary of its formation in the Yorkshire Dales and its headquarters have been completely redesigned to enable it to operate more efficiently. 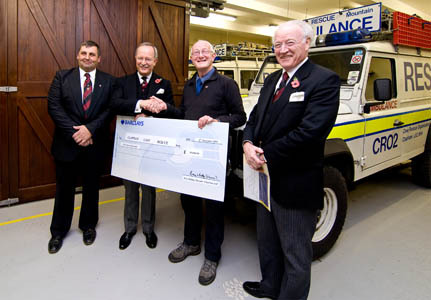 The latest grant, from Freemasons in the area, added to the £80,000 already raised for the project at its Clapham base. A cheque was handed over by members of the Wenning Lodge at Bentham, as part of a larger handout from lodges throughout the West Riding of Yorkshire, which used to include much of the Dales before its disappearance from the maps in 1974. Other cash has come from a £75,000 legacy and £5,000 from the North Yorkshire Police disposal of property fund. 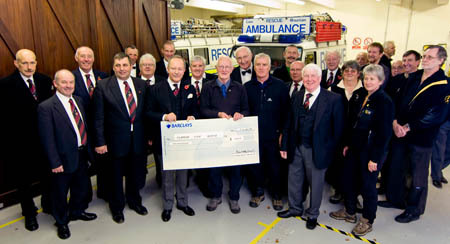 Skipton architects Bowman Riley also donated their services, worth £8,000 for the redevelopment. The cash has enabled the development of an open-space training area and internal rigging wall at the base, which was formerly the coach-house and stables for the inn next door. It has housed the CRO, which carries out searches and rescues both in the Dales caves and potholes and on its fells, since the mid 1970s. The organisation’s control room has been resited, allowing more space for its IT and mapping equipment, and a separate area for relatives has been set up. The base can now accommodate the team’s three Land Rovers and three trailers, some of which had previously been stored in another part of the village. Worshipful Brother Martin Stray presented the cheque to the organisation’s chairman Jack Pickup on behalf of the West Riding Masonic Charities. Mr Pickup said: “Our members often think that people see CRO only in terms of our claim to being ‘the world’s first cave rescue team’, but they underestimate people’s understanding of what we do. The guests were given a tour of the rescue base.